The book itself is a marketing phenomenon, having sold over 80,000 volumes in the past two months – not to mention an additional 12,000 e-books. Its publisher, Harvard University Press, is anticipates selling over 200,000 copies in the next few months alone. Reviews of the book have become a spin-off industry, spawning an enormous quantity of debate. Piketty, a professor at the Paris School of Economics, offers an extended multi-century history of income inequality culminating in an extended discussion of the galloping rise in income concentration in the hands of the rich since the 1970s. He examines the forces that are likely to sustain that momentum towards concentration of wealth and rising poverty through the foreseeable future. It is from this perspective that Piketty justifies what has come to be seen as a daring conclusion – that this growth in inequality is the result of the underlying tendencies of capitalism reasserting themselves. After the interruption of the post-World War II welfare state, the system is reverting back to what should be understood as its normal trend. This is not a shock to those socialists who have long argued that the postwar period, capitalism’s “Golden Age,” was itself anomalous. This historical incongruity can be explained in terms of the physical and financial destruction of capital during the period of the two World Wars: the high rates of taxation on inheritance and the generally “confiscatory” taxes rates needed to finance the wars; bouts of state-induced inflation that favored debtors (most prominently, the state itself); and the concessions granted to labour with an eye to maintaining its political allegiance to capitalism during the Cold War. But there are limits to how far socialists can follow Piketty’s reasoning. It is notable that Paul Krugman, Nobel Prize winning mainstream economist, rightfully sees Piketty’s sensibilities as politically and intellectually compatible with his own. He locates Piketty, correctly in my opinion, as leaning hard against the conservative right, but within an overall framework that fundamentally defends capitalism and is notably suspicious of sweeping alternatives. Piketty’s work, like Krugman’s, is theoretically situated well within the mainstream of economic theory, despite its variance with the apologetics that typify the work of most economists. Marxists have therefore been conflicted about Piketty’s work. It is a very welcome contribution insofar as it attacks a capitalism rampant with systemic and growing inequality. Such arguments are not very new, and similar points were advanced decades ago by the Economic Policy Institute, and by economists such as Jamie Galbraith and Edward Wolff. The difference between the way Piketty’s work has been received and that of earlier economists making similar points is largely the result of the Occupy movement that imbued the argument with mass appeal and prepared the public reception for just such a reinvigorated approach. Piketty’s book consists of four sections. The first, which is the focus of this brief review, provides a theoretical framework. The second and third sections provide empirical documentation. 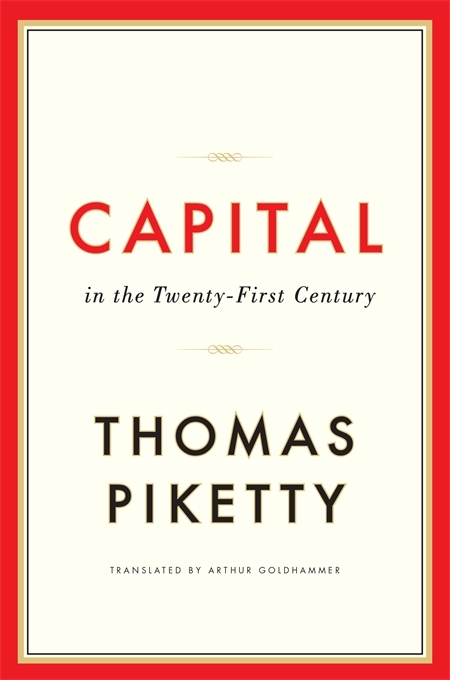 The fourth provides Piketty’s framework for reducing the trend towards further inequality. The empirical work has been almost universally hailed as groundbreaking. Piketty’s work rests on a massive in-depth and innovative review of United States Internal Revenue Service (IRS) statistics. He and his associates, most notably Emmanuel Saez, have also compiled an immense international compendium of wealth and income inequality. But, as Michael Hudson has pointed out, this reliance on IRS statistics is also the fundamental fault with Piketty’s findings. They understate the level of inequality because the wealthy do not “earn” income, they accumulate capital gains and these accruals are not generally reported in tax returns. Combined with tax evasion, Hudson avers, this means that wealth disparity actually exceeds income discrepancies. While not our concern here, this testifies to the fact that the system has already front loaded itself for elite tax avoidance, which would limit the effectiveness of any proposal along Piketty’s lines for a global wealth tax. Capital, as the title suggests, is the center of this book. However, I would dispute even Piketty’s basic definition of the term. To him, capital is all explicit or implicit return-bearing assets: land, machinery, structures, cash, bonds, and stocks. It consists of claims to surplus value produced through the labour of workers, but also embraces items subject to price appreciation, presumably through speculation on commodities such as private housing, fine wine, rare art, and precious gems. Such investments, however, are totally secondary because such repositories of wealth are neither peculiar to capitalism nor material to its central dynamics. According to Piketty, the ratio of the stock of capital (assets) to income returned in the past thirty years to the values of the Belle Époque (the period in France and Belgium of peace and economic stability before World War I), and the Gilded Age (the comparable period in the US). With the advent of the post-World War II welfare state, the share of capital income to total income became equal to the rate of profit (r) multiplied by the ratio of capital assets to income. And if the rate of profit (r) remains permanently above the rate of growth of the economy (g), this will drive the share of capital income ever upwards. This gives rise to Piketty’s now famous formulation that describes what has transpired in recent decades (r>g). Does this hold water? Mathematically, it does – after a fashion. But Piketty’s interpretation of his own findings does not. For Piketty’s reasoning to be correct, r must represent something other than the rate of profit and the process Piketty is discussing must be placed in a broader context. What then does r represent? Sheared of the misleading mathematical rigmarole presented in Piketty’s book, r represents the rate of growth in the mass of profits and not the profit rate. The rate of profit is the proportion of unpaid labour or other kinds of surplus extracted from commodity production to the capital invested. The mass of profits is the mathematical product of the rate of accumulation (the increase in the stock of capital, or of capital assets) and the rate of profit. The correct interpretation, therefore, of Piketty’s equation is this: If the mass of profits grows faster than income, capital’s share of output – and therefore inequality – will increase. If the two factors grow proportionally, income shares between the two classes will remain unchanged. If profits lag behind the growth of output, labour’s share will grow at the expense of capital. If we eliminate a rising rate of profit from Piketty’s explanation of class inequality, then the massive rise in the volume of profits must be located in an increase in the rate of capital accumulation sufficient to offset the fall in the rate of profit. Therefore, contra Piketty, a falling rate of profit is perfectly compatible with rising class inequality. But more importantly, there exists a vast store of empirical evidence demonstrating the reality of the falling rate of profit. One might, for instance, start with Deloitte’s Shift Index, readily available online. This is a massive, but proprietary, review of the balance sheets of corporations composing the major sectors of the American economy. It shows a 75% fall in the rate of return on assets since the 1960s. One can also use US Federal Reserve statistics, as I have below, to graph profits against assets (both tangible and financial) in the non-banking corporate sector for the entire post-war period. 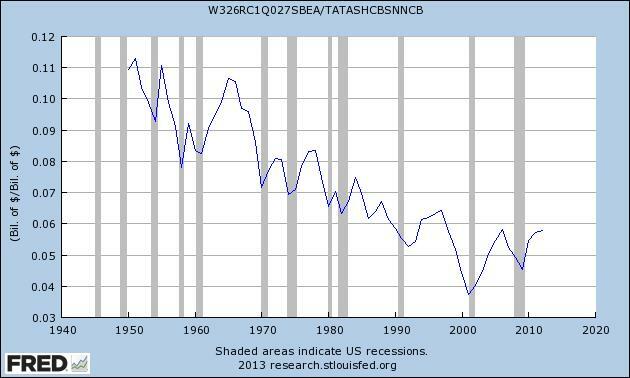 The resulting trend is similarly revealing. And yet, this too, at first blush, seems problematic. For capital accumulation, in terms of structures, inventories, and equipment, has been relatively anemic and unimpressive. This has no doubt contributed to the lagging rates of growth in output, the g side of Piketty’s fundamental equation r>g. But then how must we understand the growth in capital accumulation? The missing link is the rise in importance of financial assets in the portfolios of manufacturers and merchandisers. Financial assets as a portion of total assets of these sectors have grown by more than 80% since the 1960s, accounting for almost 58% of total assets in recent times. The flip side of hiving capital into finance is the withholding of capital from the production process. It places brakes on the forward momentum of production. What is the significance of this financialization of non-banking capital? The financial nexus that binds the various spheres of capital activity presents no new wrinkles. These financial expedients redistribute the existing values first extracted from labour in the course of production. But in the most recent period, capital has, through the massive expansion of consumer loans, opened a second supplementary field for exploitation outside, but not independent, of the production process. This is what distinguishes the current stage of capitalism. Financial relations have always existed, but they were basically intra-class capitalist relations, where the inclusion of workers was relatively marginal. Interest paid by workers for consumption goods and consumer durables converts paid labour into unpaid labour through the process of distribution and circulation. It contributes to an increase in the rate of accumulation – and therefore of profits, the r side of Piketty’s equation. By financializing the system, capital has managed to expand itself through periodic bursts of asset accumulation in excess of the fall in the rate of profit. It has therefore been able to drive the accumulation process forward, insofar as a continuation of capital expansion requires a growth in the mass of profits. But this expansion increasingly assumes the form of financial bubbles, which, upon bursting, bleed into and further inhibit the production process. Financial bubbles thereby contribute an additional source of systemic fragility. Financialization reduces disposable incomes, thereby forcing wages in many cases below the value of labour power and forcing workers into a state of debt peonage, while the increasing bite of debt further reduces overall spending. Financialization keeps labour markets slack by reducing both investment in output expansion and consumer spending. This narrows the very opportunities otherwise required by workers to raise wages or gain additional hours of work needed to meet credit obligations, to free themselves from the shackles of debt and to restore their living standards. It also means that the working class has been forced to take on more debt. Financialization as a secondary source of surplus value has, for the moment, attained a self-limiting upper barrier. Workers cannot live on air. Without increasing productivity and shedding excess capital values, the restored profitability currently enjoyed by capital is coasting on borrowed time. Far from resolving capitalism’s inherent instabilities, the means by which capital has hovered up income and increased class inequality has left the system subject to new sources of infirmity and decay. Barry Finger is an editorial board member of New Politics and a former shop steward and activist with the New York State Public Employees Federation. He wishes to thank Alan Sears and Deborah Simmons for their advice and suggestions.